Does your sushi rice always seem water-logged, no matter how long you drain it for? 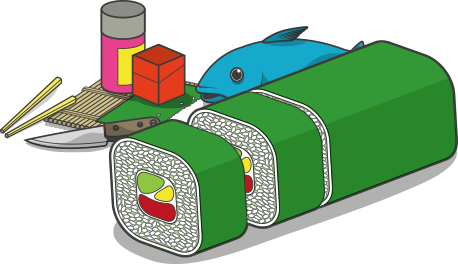 Sushi rice requires a certain amount of water content in order to make it adhesive. Too little, and it will fall apart. Too much, and you'll end up with a soggy, starchy mess that is nigh on impossible to work with. But, there is a saving grace, and it comes in the form of a large wooden bowl known as a “Hangiri Oke.” A traditional kitchen aid found in most Japanese households, the Hangiri Oke is used primarily for cooling the rice once cooked, yet also serves to 'draw out' excess moisture into the wood. Wondering why there's such a vast price difference between Cypress and Pine Hangiri Oke? With a fine grain and excellent absorbency, coupled with its widespread availability in Japan, Cypress wood has long been the preferred material for the Hangiri. Sadly, this ancient tree is now classified as NT (near threatened) on the IUCN Red List of Threatened Species, forcing manufacturers to look to other woods that bear similar properties. Hard-wearing, with excellent absorbent properties, pine is the next best thing to Cypress wood! Measuring 35.5 cm (14 inches) in diameter and 8.8 cm (3.5 inches) in depth, our Pine Hangiri Oke is of an ideal size for large families and entertaining. Its large size also serves to allow rice to be spread out, thus helping it to cool far more quickly. Though its sturdiness suggests it is made from a single piece of wood, our Pine Hangiri Oke is actually made from multiple strips carefully bonded together – untreated, so as not to compromise the wood's absorbency. Aside from their rustic charm, the heavy, decorative copper bands also serve to reinforce the bowl's structure – essential if you're prone to making sushi rice by the bucket-load!